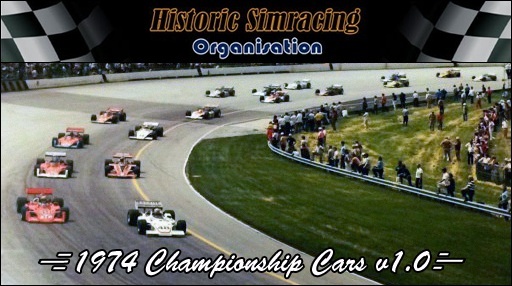 The 1974 season of the United States Auto Club Road Racing Championship was heavily conditioned by the tragic events from previous year’s Indianapolis 500, as well as by the oil crisis. USAC had already mandated a cut in fuel carried by the cars and wings size during the 1973 season, and the 1974 rules added further restrictions in an attempt to slow down the cars. The 40 gallon fuel tank (On the left side of the car) was kept, but wings were downsized even more to 43 inches and, for the first time, a limit in boost was imposed for qualifying by the use of a mandatory sealed pop-off valve. While the valve was not used in the race, the total amount of fuel available was also cut down, resulting in the need to average no more than 1.8 miles per gallon, thus forcing the teams to reduce boost and power from their engines. As a result, the crazy 1000 BHP+ from previous years were no longer reached and instead figures around 820-830 BHP were the norm, which made the Foyt engine suddenly very competitive as it was more efficient on lower boost settings than the Offenhauser. AJ Foyt benefitted especially in qualifying and got the pole at several events, including the iconic Indianapolis 500, though reliability issues prevented him from achieving the regularity needed to fight for the championship. The set of new rules leveled the field considerably at first, and the engineers were forced to come up with solutions to recover the lost speed, which came in the way of more efficient wings -The modern Liebeck airfoil profile was introduced- and softer tires, now possible because of the increased numbers of stops during the race. By mid season it was clear that it was going to be a contest between Johnny Rutherford’s official McLaren, and Bobby Unser’s factory Eagle 74, the latter eventually becoming the deserved champion. Recreating the limited boost qualifying rules in rFactor would have been too complicated, so we decided to set an average order for the cars that reflects properly their performance over the season. The Coyote Foyt is thus the quickest car together with the factory Eagle and Mclaren, but most of the field will be quite close behind. The driving of the cars is still challenging, though easier than in the 1973 mod because of the reduced power, and driving finesse and setup prowess will be paramount because of the reduced differences between cars. Goodyears and Firestones have similar grip, but the latter will heat more and degrade quicker. In 1974, Firestone was on his way out of competition and it reflected in the performance of his tires. The Foyt has 825HP and is more peaky. The Offenhauser has 820 HP but is more violent. The Chevrolet has 810 HP but is smoother. Fuel consumption is similar in all cars, requiring 7 tanks (6 stops) in a 500 mile race -barring any caution laps period. In general, the performance of the cars is much closer than it was in 1973. Any car from the first 4 groups can win with a good driver. Extract the contents of the archive into your rFactor folder. We highly recommend the use of a dedicated rFactor lite install. Be sure to set your player file to “Helmet=0” for the historic helmet to display in your car. Resources: Oldracingcars.com, Racing-reference.info, LOTS of specialized books. Special thanks to: Kangaloosh for the carfactory program used to check that everything worked as intended, Bristow, Niels Heusinkveld and many others for all the knowledge about ISI physics they have been sharing around these years. Hello, I was not aware of the 1974 USAC, where is it possible to download it? I really loved the 1973! You can find the mod in this thread along with the up to date track and some updates you can find the Indianapolis Race Thread. Can you also please edit your profile to show your real name please. As per HSO rules. Name updated. Sorry, I messed up with my profile. Thanks for sharing the great mod. I think he had an old profile and lost the password, so he created a new one. We should fix that as it will mess up his statistics in the database. We should fix that as it will mess up his statistics in the database. He has no starts, so that shouldn't be a problem.